The Steelers open their rookie camp today in the Steel City. It’s their first look at their draft picks and undrafted free agents going through the drills and plays in their system. Besides the obvious guys, two UDFA’s to keep an eye on are Tyriq McCord, a linebacker out of Miami and Canaan Severin, a wide receiver from Virginia. McCord is a thumper who brings good size and decent quickness while Severin was lost in a Virginia offense that was pretty bad. The chances for these guys making the roster are quite slim but they could find themselves on the practice squad. Lots of talk about Le’Veon Bell doing a collaboration with rapper Snoop Dogg. I’ll say the same thing I’ve said about Antonio Brown doing ‘Dancing With the Stars;’ if it doesn’t affect on-field preparation then go for it. Unfortunately, its not a good look for Bell to go hang around a guy who is not shy about his marijuana use. I can tell you without hesitation the Steelers’ front office is not crazy about this. Love the comments by Charles Barkley who said the Atlanta Hawks need to “take someone down” after they were destroyed by Cleveland. He wasn’t advocating violence. He was merely stating the obvious; you can’t let these guys dictate play if you expect to win. I miss the days of this kind of chatter when teams could openly talk about ‘taking down the other team’s quarterback.’ We have gotten soft people. Adams’ release wasn’t surprising. He has struggled with back problems for some time now. Add in his other unfortunate circumstances and what you have was a mounting tide that just couldn’t be contained. His drafting should serve as a major learning experience for the Steelers. Adams if you recall promised the Steelers he could change and would do what it took to play for the Steelers. This was after some problems at Ohio State. The Steelers bought in and got pretty much nothing in return. The signing of Bruce Gradkowski is a good one and a necessary one. 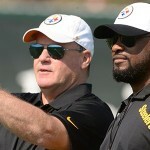 The Steelers could not afford to go into camp with just Landry Jones penciled in as the back-up. Gradkowski comes cheap too and that’s always nice. To this point, the Steelers have signed just their two seventh round picks but with the salary scale being what it is, the others should fall in line soon. I realize that I’m in the minority here, but I do not consider Adams a bad draft choice. Maybe a reach as a 2, but not a bad pick. If you recall, in both 2012 and 2013 Adams proved his worth as a run blocker and, had he not gotten injured, it is my belief that he would have made a fine right tackle. 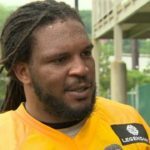 Chris pointed out the other day that there was a point where Adams was playing and then was out injured and the Steelers running game went over a cliff. That was 2013. I believe a number of things contributed to Adams’ failures as a Steeler. Coaching (Sean Kugler, the man who sold the Steelers on the idea that Jonathan Scott could be a competent starter at left tackle! ), injuries, Adams’ lack of confidence in himself and lastly poor footwork (oversetting) and reaching with his shoulders instead of bending at the knees and waiting for the rusher in pass pro. The injuries may have hurt him most because he was out hurt for a lot of 2014 (only active 4 weeks) and all of 2015. His lack of availability did not allow him to work with Mike Munchak; the offensive line coach has been the best free agent addition to this team in over a decade. So yes, Adams’ abilities did contribute, but so did poor coaching and injury. The fact that he was such a good NFL run blocker for a time shows me that he does have some ability. Just not enough to warrant additional time in the organization. Sometimes it comes down to circumstances though, and not just a guy’s abilities.